Leave your message below for RPCVs who served in Haiti. 2. Want to come to Haiti to translate? i am looking for someone to help me with finding out information on Hatai, please email me and we can talk. thank you SO much. i need to talk as soon as possible. PLEASE EMAIL ME! Hello Haitian RPCVs. Could someone possible tell me the date that PCVs were evacuated from Haiti in 1991? I think it was in May but I am not even sure about that. Thanks in advance for your help. The aircondition is really cold in the library, therefore my job search is going really slowly since the joints in my fingers have froze up in turn making it very difficult to type. Life in America is so difficult, I miss Haiti...uh oh! We are a US Catholic parish near Washington DC. We send money to a sister parish near Cap Haitian. We are working to begin a medical "arm" or our assistance to them. We need advice form any RPCV who served in the area. We also will need a Creole interpreter to accompany our assessment team in May 2004. Anybody out there want to help us out? 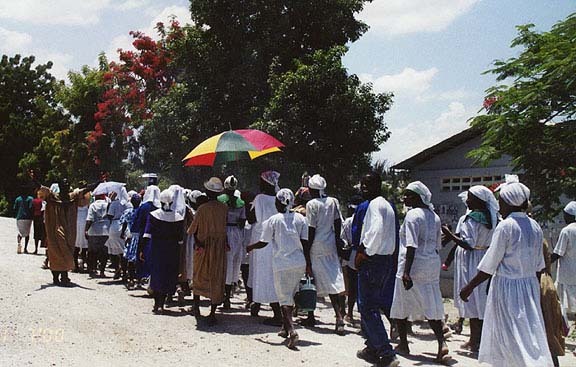 I served in Fort-Liberte, Haiti, in 2001, from March until December (group 11). I now have a dream job with the Federal Government in sunny San Diego. I am trying to transfer to Miami so I can use Kreyol. I would love to hear from other volunteers from my group. My name is Matt Ray and I'm wondering if the Peace Corps plans on going back to Haiti any time soon. Does anybody know? I am currently a volunteer Translator for Healing Hands for Haiti Foundation and go for 2 weeks a year to translate. I also work as their webmaster. I am very interested in volunteering with the Peace Corps but was bummed to see that they are no longer there. Any plans in the future? Please let me know if you know of anything in the near future. I'm thinking in the next few years to join up with the Peace Corps and would really like to serve in Haiti. I was wondering if you have medical assistance in Haiti. I have been working in NY with a Haitian singer who's mother is in need of assistance there as a 72 year old diabetic and cannot afford treatment. If you have any suggestions, it would be most appreciated..
Will gladly help as a volunteer in the U S or in Haiti as an interpreter.